Click on a question to view the answer. If you would like to share this information with others, feel free to print these questions and answers using the printer icon at the bottom of the page. The purpose of Cancer—Now What? is to empower those diagnosed with cancer and their loved ones to navigate the medical, emotional, relational, and spiritual challenges of cancer. It’s a book that anyone can give to a friend, relative, colleague, congregation member, client, patient, or other person he or she knows who is facing cancer. The people who benefit most from reading and using the book are those with cancer and their loved ones. It provides practical information and ideas to guide the patient and family through the many different challenges brought on by cancer. In addition, anyone interested in learning how to better understand, help, and support people who are dealing with cancer would benefit from reading this book. How does this book help someone diagnosed with cancer? The practical information and insights equip people with cancer to deal with the medical, emotional, relational, and spiritual challenges they may encounter. How does this book help the loved ones of someone with cancer? Cancer—Now What? offers help for loved ones in several ways. The patient’s loved ones will encounter their own emotional, relational, and spiritual challenges, and the principles and ideas in the book can help them navigate those challenges. The book helps loved ones find ways to provide help and support that are truly needed—for instance, finding reliable information, asking good questions during appointments, and relating well with the medical team. The book equips loved ones with ways to increase their knowledge about cancer, treatments, and other relevant topics so they can support their loved one in handling medical matters. Cancer—Now What? is written to help both the person with cancer and his or her loved ones. What is the author’s personal and professional experience with cancer? Dr. Kenneth Haugk walked alongside his wife, Joan, throughout her battle with cancer—supporting her, being with her at appointments and treatments, researching information about her type of cancer, and relating with the medical team to help her get the best care possible. As a pastor and clinical psychologist, he has provided professional care and counseling for numerous people with cancer and loved ones of those with cancer. In addition, he has offered care and support to many friends, relatives, and others who were dealing with cancer. In writing Cancer—Now What?, Dr. Haugk also drew on his training and experience as a researcher, leading a 16-person research team to gather extensive information from more than 3,500 medical professionals, cancer survivors, and loved ones of people with cancer. Their personal and professional wisdom was incorporated into the book. Read more about the research for the book here. Is this book more about medical topics or emotional topics? It covers both areas, as well as other key topics. The aim of the book is to support and empower the whole person dealing with cancer, helping the patient and family navigate the wide range of challenges that cancer brings. To that end, about one-third of the book’s content deals with medical matters, and the other two-thirds address emotional, relational, and spiritual concerns. Part 1. What Do I Do Now? Each of those parts is broken into concise chapters addressing specific issues. The structure of the book helps readers quickly find and read whatever is most important to them at any particular moment. See more of what’s inside the book, including selected chapter excerpts, here. How do people use this book? The thematic organization of the book helps people quickly locate the specific topics they need. 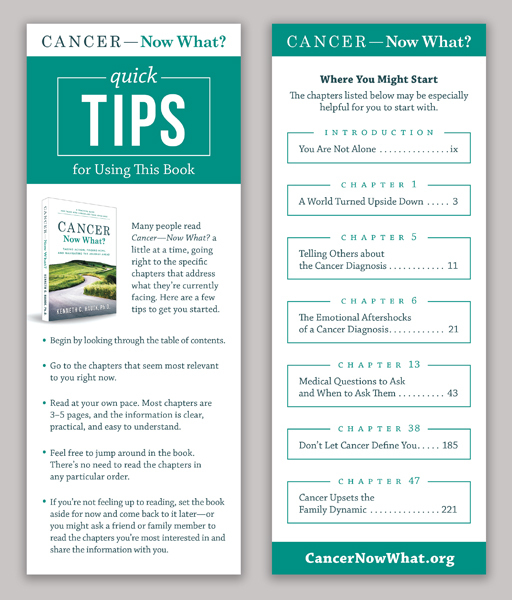 The Quick Tips card, included inside each copy of Cancer—Now What?, offers some suggestions about how to use the book. What is the Quick Tips card? The Quick Tips card, included inside each copy of Cancer—Now What?, offers suggestions for how readers might use the book, including a list of chapters they may want to start with. When you give a copy of Cancer—Now What? to someone dealing with cancer, you might point out the card as a tool for getting started with the book. How can Cancer—Now What? be used within Stephen Ministry? A Stephen Minister could give the book to a care receiver dealing with cancer and possibly suggest specific chapters the care receiver may find most helpful at the time. Stephen Ministers or Stephen Leaders could help coordinate giving or sending the books on behalf of the congregation or organization. The book can be used in continuing education, helping Stephen Ministers better understand what people experience after a cancer diagnosis and offering ideas for ways to provide help and support. What kind of research went into this book? Over the course of five years, Dr. Kenneth Haugk and his research team connected with and learned from over 3,500 people who have had personal or professional experience with cancer. These people included cancer survivors, loved ones of those with cancer, oncologists, and other medical professionals involved in cancer care. The research involved one-to-one interviews, focus groups, surveys, and having people read and provide feedback on all or selected parts of the book. The insights, experiences, and suggestions from all these individuals were invaluable in making sure the book would be as authentic, accurate, and valuable as possible for those dealing with cancer. When should I give this book to someone dealing with cancer? You can give the book to a person with cancer or that person’s loved ones at any time after you learn about the diagnosis. It’s helpful for people to receive a copy of the book soon after diagnosis. The opening chapters address topics that a person is likely to face from the beginning, including handling the initial shock, telling family and friends about the diagnosis, and preparing for the emotional highs and lows to come. Even if some people need a little time before they start using the book, they’ll have it on hand when they’re ready. Cancer—Now What? also offers practical information, guidance, and support that is helpful at any time after diagnosis. A number of issues that come up soon after diagnosis may continue over time, and new ones may occur as well. Whenever there’s a challenge, question, or concern, the reader can go straight to the chapter that deals with that topic and draw on the help it offers. People who have received the book have said that it’s valuable at any time, whether soon after the diagnosis, during treatment, or later on. How have people with cancer and their loved ones responded to receiving this book? The overall response we’ve heard from those who have received the book has been enthusiastic. People who have given copies of the book have told us that people greatly appreciated receiving it. Recipients have said the book provided invaluable help at a time when they didn’t know what to do—and showed how much the giver cared for them. Why did Stephen Ministries develop this book? There were a number of reasons why Stephen Ministries developed this resource. An essential part of Stephen Ministries’ mission is ensuring that people who are hurting receive the care they need. Cancer—Now What? addresses a significant need for care in a very challenging situation. Stephen Ministries also provides training and resources to help with caring for those who are hurting. Cancer—Now What? is a resource to give to those dealing with cancer—a simple, powerful way to offer help and hope. Cancer—Now What? fits Stephen Ministries’ passion for creating practical, empowering resources by providing essential information and helpful suggestions that help people deal more effectively with cancer. Cancer—Now What? has personal significance for Dr. Kenneth Haugk, the founder and Executive Director of Stephen Ministries, because of his wife’s battle with cancer. The book draws on what they learned together during that experience. Stephen Ministries serves a wide range of people who have experience with cancer—including survivors, loved ones, and medical professionals—and conducted extensive research with them to help develop the content of the book. Read more about Stephen Ministries here.